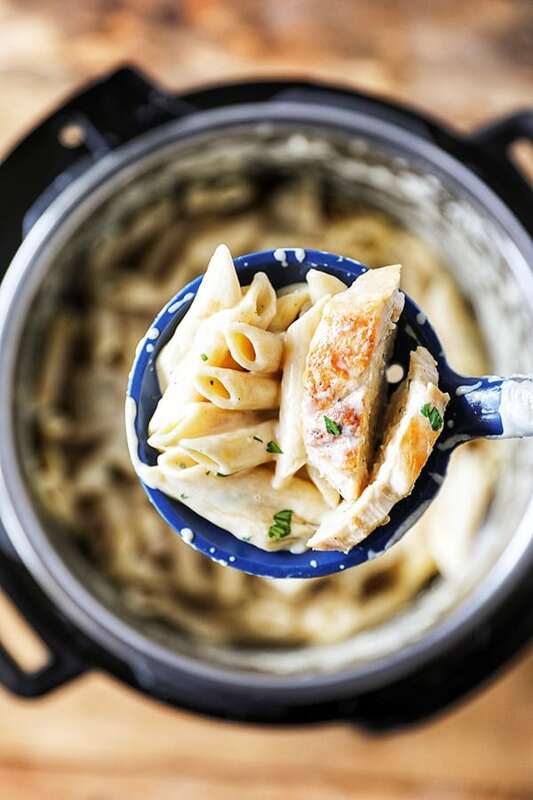 This recipe is a variation of the One-Pan Chicken Alfredo I developed in 2013. That is still one of my family’s favorite recipes, and truly a reader favorite too! Start by searing the chicken breasts on high Saute mode. You select high Saute mode by hitting Saute, then hit adjust until the indicator light shows More. Then remove the chicken breasts, add minced garlic to the Instant Pot and sauté for about a minute. Follow with chicken broth, heavy cream, uncooked penne pasta, salt and pepper, as well as the chicken breasts. Lock lid and cook on Manual Mode, High Pressure for 6 minutes. Quick Pressure Release and set aside chicken breasts to rest before slicing. Gradually stir in freshly grated parmesan cheese. See more of my Instant Pot Recipes Here! Season chicken breasts with salt, pepper and garlic powder. Set 6 Qt Instant Pot to Saute function and hit Adjust button until More is lit. This heats Instant Pot to highest heat for searing. 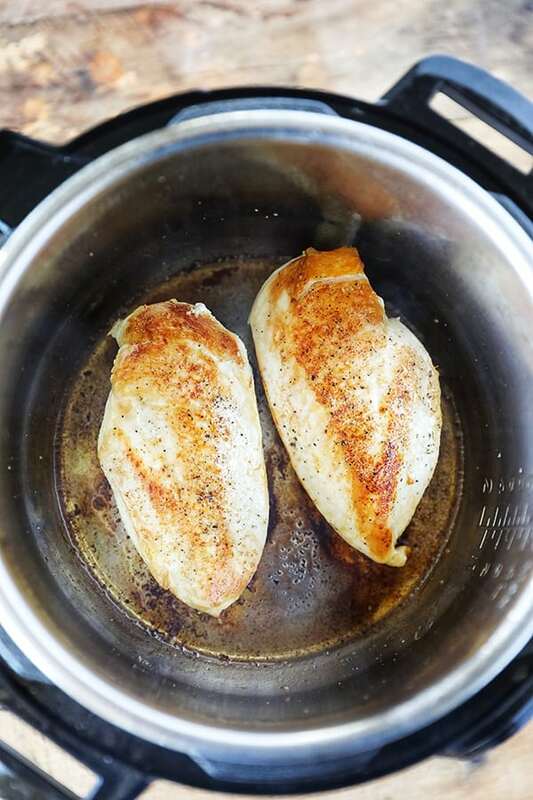 Sear chicken breast in Instant Pot for several minutes on both sides until evenly browned. Remove chicken from pot and set aside to be added back in with the rest of the ingredients. Add garlic to pot and cook for about one minute. Add chicken broth and use wooden spoon to scrape up browned bits from the bottom of the pot. Add heavy cream, uncooked pasta, a teaspoon of kosher salt and several turns of freshly ground pepper. Return chicken breasts to Instant Pot and stir all ingredients together. Hit off button to end Saute function, then lock lid in place with Pressure valve set to sealing. Cook on Manual, High Pressure for 6 minutes. Instant Pot with take 10-15 minutes to come to pressure and then countdown from 6 minutes. Once cooking is complete, use Quick Pressure Release. Since we are cooking a pound of pasta, there may be some starches and liquids that start to splatter. If that happens, use wooden spoon or an oven mitt to quickly close pressure valve. Wait one minute and try again. Once pressure pin drops, unlock lid and remove chicken breasts. Use a meat thermometer to ensure they have reached 165 F degrees. Set aside to rest. Stir pasta and cream mixture together and slowly add in freshly grated parmesan cheese. 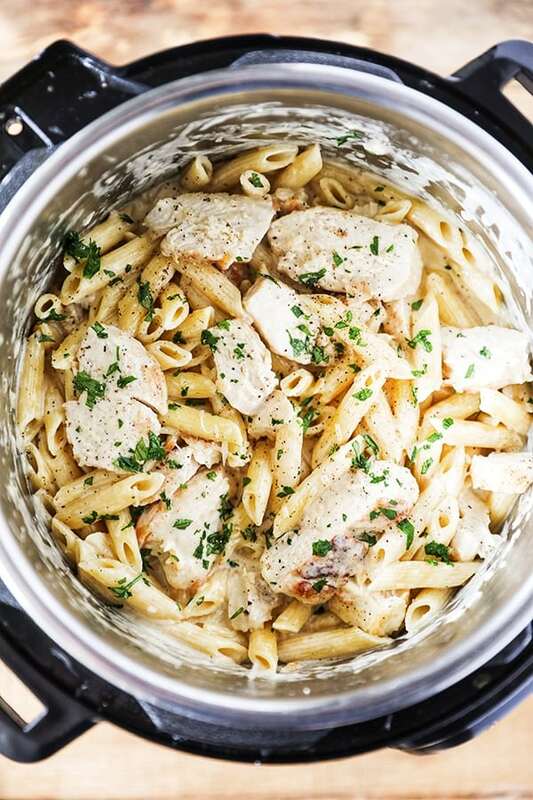 Slice chicken breast and combine with pasta. Serve with additional freshly ground pepper, shredded parmesan and chopped flat leaf parsley. Do not substitute milk, or half and half for heavy cream, it will not stand up to the high heat of pressure cooking. For best results, use real parmesan cheese grated on a microplane. Store bought grated parmesan cheese will not melt properly and will stick to the bottom of the pot. If halving the recipe, keep same cooking time. That looks really good! My kids love chicken pasta so much. Can’t wait to make this for them. Thanks for sharing! My kids love chicken alfredo but the only recipe I know is the one you have to bake. 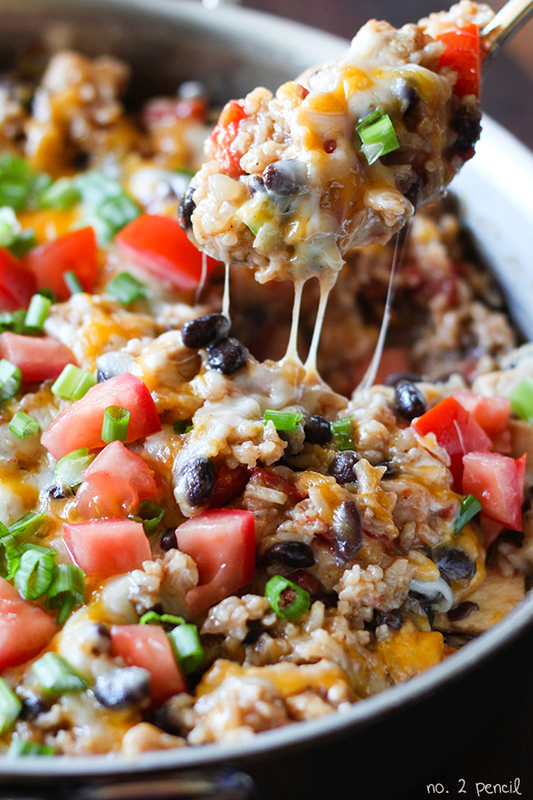 I don’t have the time to make that recipe and I am always looking for something much easier(as I am sure many of us mothers are) I can’t wait to try this, it looks really yummy. Thank you for making something simple and delicious to try with my family. Made this tonight to feed a larger group. Doubled the recipe and just needed to add on 4 minutes of cook time for the additional pasta. Also, instead of cooking the chicken in the recipe, I just used chicken that I shredded from a Costco rotisserie chicken. Everyone LOVED it! Thank you. I love you’re Cajun chicken and sausage Alfredo recipe! I just got an Instant Pot on Black Friday and I want to try this recipe with the sausage! Can I brown the sausage with the chicken and cook them together? I’m afraid the sausage won’t turn out well since it’s already cooked! I can’t say enough about this recipe. Made it for dinner tonight and we all had 2nds. Simple but delicious. Thanks for sharing! Just made this and my husband says it’s better than the Olive Garden and he loves the Olive Garden. 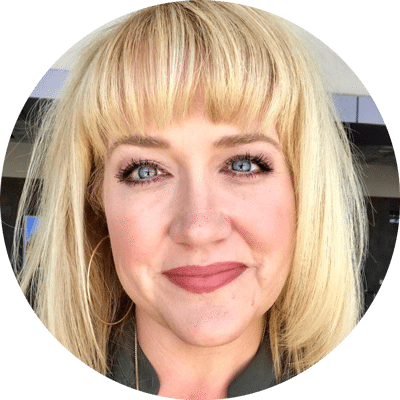 Excited to try more of your Instant Pot dishes! Mine was somewhat runny, even after letting it set up for a bit.. not sure why. Sounds fabulous but heavy cream is a no no in my kitchen due to dietary restrictions for my husband. This would be perfect in my beloved IP! Amazing recipe. We are making it for the 3rd time now, after discovering this recipe just a couple of weeks ago! Made this the other night for my family and got a phone call from one of my kids who hates everything I make, telling me that this was the best meal he’s ever tasted! That’s a win if you ask me. I also used rotisserie chicken instead of what the recipe called for and it turned out delicious! Keep the recipes comming!